What’s in These Lash Treatment Products? Eyelash enhancers may contain a variety of ingredients – depending upon the product. Some contain various combinations of vitamins - which the manufacturers claim creates a healthier environment for eyelash growth. Products containing only vitamins are unlikely to be harmful, but it’s also unlikely that they’ll have any real effect on eyelash growth - since vitamins have never been shown to stimulate eyelash growth unless there’s a deficiency. On the other hand, some unscrupulous companies are marketing lash growth treatments that contain prostaglandins. These are hormone-like chemicals that are naturally produced in the body and have a variety of functions – one of which is to lower the pressure behind the eye. Because of this property of prostaglandins - prostaglandin analogues are often used to treat glaucoma. One of the effects of using these prostaglandin analogues is increased eyelash growth. Lash Growth Treatments: Can They Lead to Eye Damage? Of course, the FDA doesn’t allow prostaglandin analogues in cosmetic products because they can lead to eye problems. So, the manufacturers of these lash growth treatments are illegally marketing what’s essentially a drug - as a cosmetic. So, you don’t know what you’re getting when you buy these lash treatments. Nevertheless, most don’t work and when they do, it may be because they contain illegally added prostaglandin analogues. There is now a FDA approved lash growth treatment on the market called Latisse. Latisse is a product that also contains a prostaglandin analogue – but one that’s been studied and cleared by the FDA. It can help people grow longer, thicker lashes, but it, too, has some drawbacks and side effects. For one, it’s expensive. The cost of a month’s supply of this lash growth treatment is $120.00 – not exactly chump change for most people. Plus, it can cause eye color to turn brown and the lids to darken. Some people also experience eye redness and irritation. On top of that, health insurance usually doesn’t pay for this type of cosmetic treatment. Eyelash Enhancers: The Bottom Line? It’s best to avoid cosmetic lash growth treatments since most are ineffective, and the ones that do work could contain illegally added prostaglandin analogues. Latisse is a prescription option that works for many people, but also has disturbing side effects such as eye and lid color changes. The best option? Stick with safer options such as lash extending mascaras. Can argon oil be used as serum to grow healthy eyelashes? 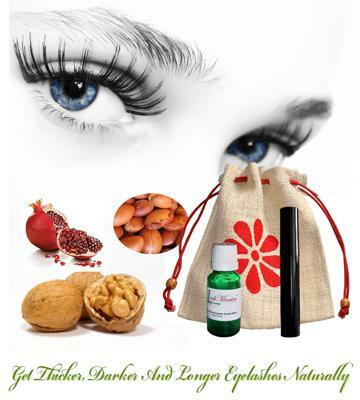 Argon oil will certainly nourish, moisturize and lubricate eyelashes and have great benefits for hair as moisturizer – it has anti-inflammatory properties and very light and non-greasy – And this by itself helps eyelashes to look healthier and appear longer BUT there is no scientific proof to support eyelash growth (True growth: by having impact on growth phase “anagen”). So it’s a matter of perspective. I need to find out how I can grow my eyelashes, and eyebrows, I fell bad even when I add mascara on eyelashes hardly can apply the mascara. If you have thin and fragile eyelashes, then try to look for eyelash enhancers that are formulated with keratin. Apply it for about a month and you get a much stronger and thicker eyelashes than before. Don't try to use mascara as your only cosmetic tool for your lashes. Work on it and even wear the enhancer under your mascara for maximum effect. It won't last, but after a month or two with three days a week application, your lashes will grow thicker and stronger and you might even drop mascara and go for natural look. It will also enhance and prevent damage and breakage of thin and fragile eyelashes. Its a new innovation and it works. Ask for eyelash keratin based enhancer or boosters. There are several companies that making them.